Your next embedded design idea has a new home! Curiosity is a cost-effective, fully integrated 8-bit development platform targeted at first-time users, makers, and those seeking a feature-rich rapid prototyping board. Designed from the ground up to take full advantage of Microchip's MPLAB® X IDE development environment, Curiosity includes an integrated programmer/debugger, and requires no additional hardware to get started. The Curiosity Development Board is the perfect platform to harness the power of modern 8-bit PIC® Microcontrollers. Its layout and external connections offer unparalleled access to the Core Independent Peripherals (CIPs) available on many newer 8-bit PIC MCUs. These CIPs enable the user to integrate various system functions onto a single MCU, simplifying the design and keeping system power consumption and BOM cost low. Have an IoT design idea? Curiosity can make it real. Out of the box, the development board offers several options for user interface - including physical switches, and mTouch® capacitive button, and an on-board potentiometer. A full complement of accessory boards is available via the MikroElectronika Mikrobus™ interface footprint. In addition, Bluetooth Low Energy communication can easily be added using an available Microchip RN4020 module. The Curiosity Development Board gives you more for your money. It can be operated as an all-in-one development platform, or it can be customized to suit your individual tastes. 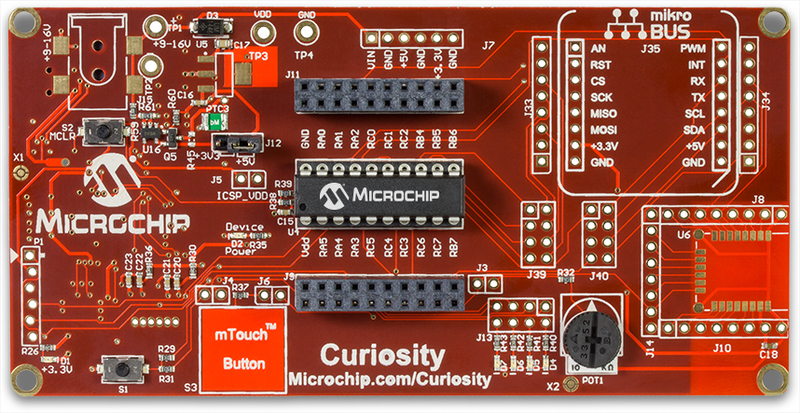 The Curiosity Development Board was designed to expand its capabilities as your needs grow. ■ Multiple Power Options – The Curiosity Development Board allows you to select from USB power, 5 V internal, or 5 V external sources for the ultimate in flexibility. ■ Expansion with MikroBus – With the option to plug in MikroElectronika Click™ boards, the Curiosity Development Board gives you access to nearly 100 inexpensive add-on boards, which can add capabilities ranging from GPS to alcohol sensing. ■ Wireless Ready – Add Bluetooth to any design with an available RN4020 wireless module.